Cyber threats have become so commonplace that most of us are apprehensive about working without installing a proper security suite our system. Thanks to the vast antivirus market that throws at us a plethora of products akin to solutions in rendering antivirus protection, we can at least keep the usual suspects at bay by installing the right security program. Heimdal PRO is one of the few supplementary security programs that offer protection of the best kind. The program is designed to give supplementary security to antivirus on Windows operating systems to be specific. The reason why its preference has started soaring above most of its counterparts is chiefly that of the advanced malware security it provides with plenty of third-party antivirus features. You simply have to install this wonder product and then see the benefits you can reap from it. So what is Heimdal PRO anyway? 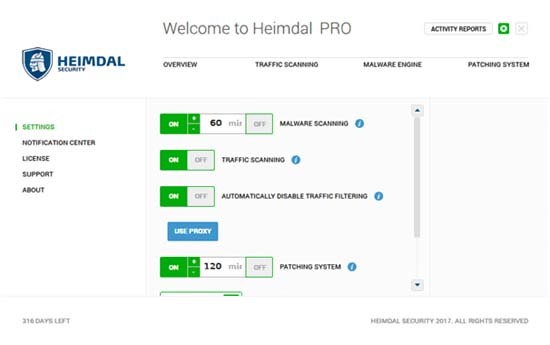 To start with, Heimdal PRO is a software application designed in a way that provides additional security to Windows PCs that are connected to the internet. The solution is entirely cloud-based and complimentary to any anti-virus program that is already running on the system. For all those looking toward a 'second layer of protection', this is the one to choose and definitely to guard against data-stealing, financial issues, ransomware and more. One important aspect of the security suite is that it's not a replacement of any existing antivirus product or the firewall. Heimdal PRO ideally complements all such forms of security products. - Heimdal Free: This is the freeware version that will scan your system to locate third-party applications or security loopholes if any. The moment even one is detected, the application updates the programs and that too, in the latest versions. - Heimdal PRO: Home users and small office attendees can rely on this commercial version without a doubt. It analyzes all incoming and outgoing internet traffic (http, https & dns) and keeps vulnerable applications up-to-date, protecting users against exploits. - Heimdal Corp: The software also has a corporate version and this is the one that provides effective statistics and centralized management for all the computer systems running Heimdal. This comes in addition to features present in consumer products. Regardless of the version you wish to use, it's important you enter the license key, particularly for 'PRO' and 'Corp' versions. For the 'Free' one, simply enter the email address. The activation being complete, the wizard will then inform about the installation. Once that's done, the software application will get to work. The importance of securing a Windows PC is increased manifold when it comes to personal and banking information. There are few requirements for running the program. However, remember that the PRO version is only meant for Windows systems. - First, the program requires Microsoft, .NET Framework 4.6.1. If that's not present on the systems Heimdal ensures to do an automatic download and installation of the same. - Second, it's compatible with both 32 and 64 bit systems. And talking about Windows, it runs on Windows 7, 8, 8.1 and 10. From the time of its installation, the program scans the internet traffic just to block 'malicious' websites and the content known for 'zero-day exploits'. To add to it, the program applies a filter on the network adapter. The basic function is scanning for certain sites, advertisements, servers and so on. These are essentially meant for disabling spyware, malware or checking on cyber attacks. Very often, we come across suspicious codes. In order to detect dangerous scripts, financial details, spyware, malware, Trojans and similar such viruses, the Hemidal PRO checks for malware through its built-in malware engine. It compares all the signs of files present on the system and updates the database on a regular basis. Thankfully, the process causes no such problem to the performance of operating systems. It just works silently in the background without affecting any other scheduled task. 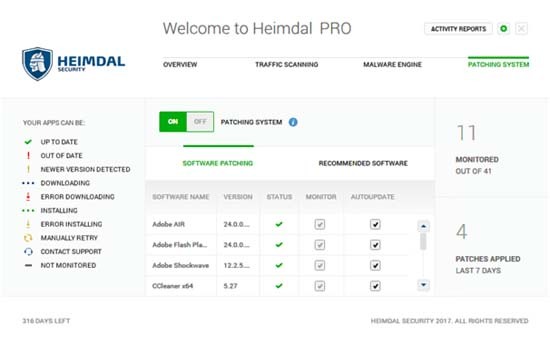 The following are some of the software programs that Heimdal Pro patches- Chrome, VLC, CCleaner, WinRar, Adobe Flash Plugin, Adobe Reader, Google Drive, Acrobat Reader, Adobe Flash Plugin, iTunes, Adobe, Java, QuickTime and much more. An important aspect that must not be forgotten under any circumstance is that Heimdal PRO is an add-on when it comes to the protection bit. To classify it under the head of any antivirus program would be a mistake since it's designed to enhance the system security. On the one hand, Bitdefender is pretty much innovative in providing a four-in-one security solution; and the other is Kaspersky with several functions packed in one suits. These include antivirus protection at the time of browsing, audio and webcam protection, and online payment security. Comparing these three would actually point at each one's advantage in respective aspects, which is exactly why it makes all of them unique. Heimdal is not new in the market. It was launched way back in 2011 and presently has a record number of users (approx 300,000). Packed with a lot of useful features, Heimdal checks to see that almost all the apps are running efficiently. In fact, every 2 hours, the outdated apps are updated to the newest version. The solution till date has eased out close to 12 million problems and blocked 15 million dangerous websites. Isn't that super-impressive?